Renderings are intended for graphic representation only. The features are representations only and the developer reserves the right, without notice or approval,to make changes and substitutions to the features, materials, and equipment. Renderings may include upgrade options. 1W — 3 Bedroom/2.5 Bath, 2492 sf. 3W — 4 Bedroom/3.5 Bath, 3202 sf. 4W — 3 Bedroom/2.5 Bath, 2679 sf. 1E — 3 Bedroom/2.5 Bath, 2439 sf. 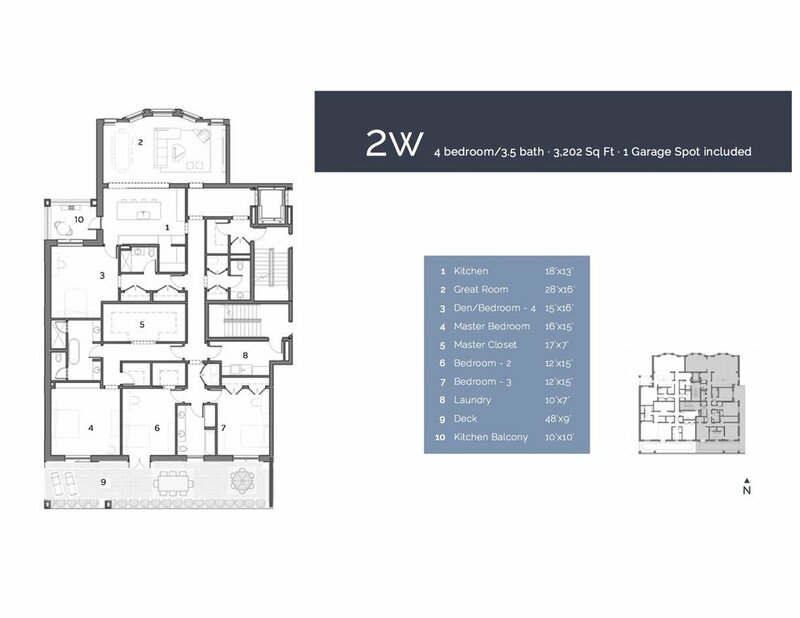 2E — 4 Bedroom/3.5 Bath, 2900 sf. 3E — 4 Bedroom/3.5 Bath, 2900 sf. 4E — 3 Bedroom/2.5 Bath, 2146 sf. + StoneSource – Buyer to select bath floors, shower/tub surrounds and kitchen backsplash. + Stand-alone master bath tub, if applicable. Few neighborhoods in the country rival Lincoln Park for its combination of culture, convenience and laid-back luxury. 445 Arlington puts you in the heart of it all. Located just west of the Lincoln Park Zoo, homeowners will enjoy easy access to all that makes Lincoln Park such a coveted community, including the lakefront, world class theater, award-winning restaurants, dangerously good shopping and top-rated public and private schools. Contemporary Concepts Inc. Established in 2004, is a Chicago based developer that has been delivering quality products in Chicago and its immediate surrounding for over eleven years. With an emphasis on innovation and meticulous planning, it continues to push the envelope of design to bring new high-end buildings to market. Contemporary concepts has experience managing high density infill, multifamily and mixed-use developments and has expertise facilitating the necessary zoning and entitlement, and evaluating project profitability and construction costs. It oversees the entire development process from land acquisition to construction completion and project delivery. LG Construction has been hired as the General Contractor for the 445 Arlington development. Over the past 12 years, LG’s hard work and dedication to perfection has established them as a premier full-service general contracting and development firm. LG’s roots are in high-end, custom, single-family homes and condos, and that tradition of detail continues today LG builds around their client’s lifestyle, needs, and budget, and are able to keep them in the loop at every stage of the build. While they focus on high-style design and craftsmanship, they know that the process of completing a project well is crucial. LG utilizes the strengths of well-coordinated project teams to seamlessly manage all aspects from start to finish. LG’s process during the project is just as important as the completed product; many companies can get the job done, but few can get it done in a way that also makes the journey enjoyable. Booth Hansen’s contribution to the built environment is innovative, resourceful, and versatile. We approach all projects with the same fundamental ambitions—to creatively develop program, to productively deploy building technologies, and ultimately to capture the unique spirit and quality of each project, free from the constraints of style. Our office is organized into teams that focus on different aspects of our practice: Design, Management, Technology, Communications, Research, and Sustainability. Our teams support one another daily and provide the full framework required to carry projects to successful completion. We believe in the power of collaboration among designers, clients, consultants, and stakeholders to produce successful results. We have been in practice since 1980 and have received over 90 local and national design awards, including 36 from the American Institute of Architects. For Erin Mandel, real estate is more than a career choice, but rather a true passion. Over the last decade, she has certainly made her mark in Chicago. Erin joined @properties in August 2010 after a successful beginning with The Belgravia Group. While with The Belgravia Group, Erin sold over $85 Million of new and rehab construction totaling to over 280 personal real estate transactions. Now a top producer with @properties, she has quickly become one of Chicago’s most dynamic and effective agents. She maintains a professional yet personal appeal and takes a strong leadership role in managing client expectations. As a result, Erin is recognized in the top one percent of Chicago’s real estate professionals. As brokerage continues to become less reliant on face to face interaction for some; Erin remains committed to the value of relationships as her business is heavily maintained by referral and repeat clientele.